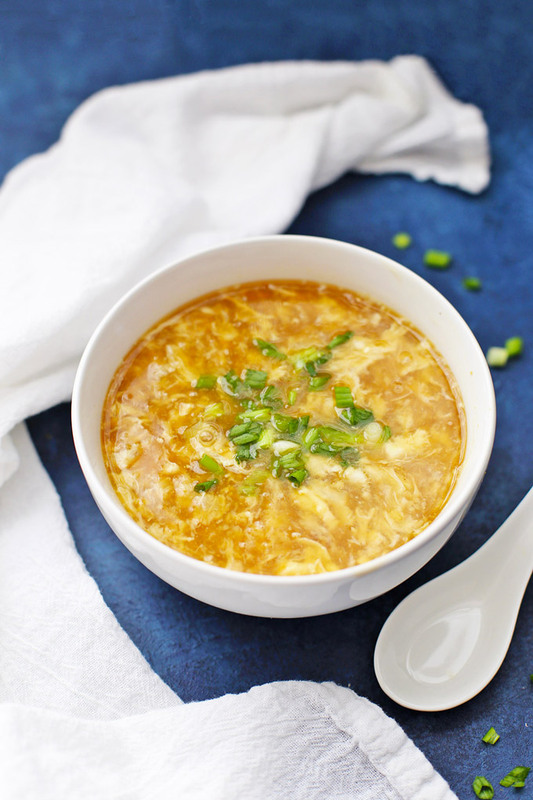 Egg Drop Soup – This takeout favorite is SO easy to make at home. It’s done in no time and is a total family pleaser. (Gluten free, to boot!) Scroll down for recipe & a how-to VIDEO! Post, photos, and recipe updated Oct. 2017. Originally posted Dec. 2012. So, we’re definitely (like DEFINITELY) still in the throes if childhood picky eating at our house. Milo and Sophie are both finicky eaters (despite doing all the “right” things), but there are something they love that just make me laugh. Milo, for instance, once ate about 8 oz of smoked pork shoulder at age two and threw a GIANT fit when we cut him off. Sophie, since she was a tiny toddler, has LOVED egg drop soup. Something about the slurping, and the mild flavors really make her happy. I get it! 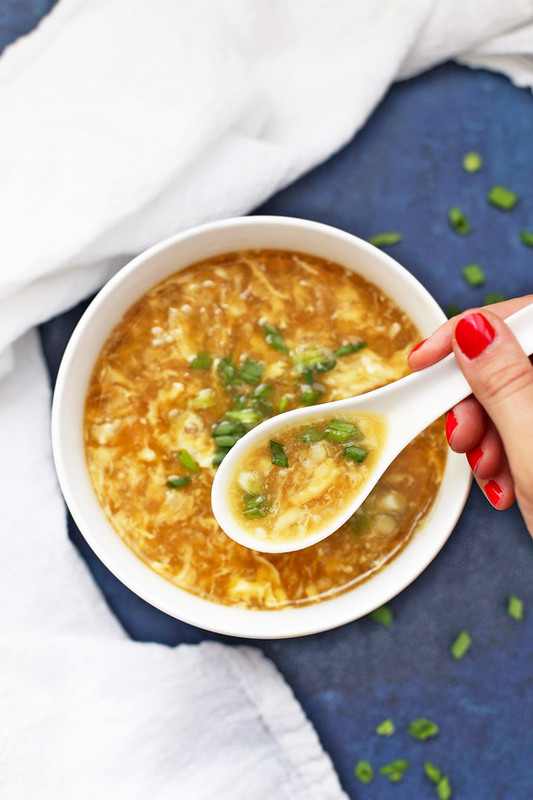 Egg drop soup is one of those simple classics I can never quite get enough of. We went out to PF Chang’s recently (their gluten free menu is remarkably good!) and Sophie had bowl after bowl of the egg drop soup. I was reminded all over again how GOOD it is. Which, naturally meant I needed to make some at home immediately. 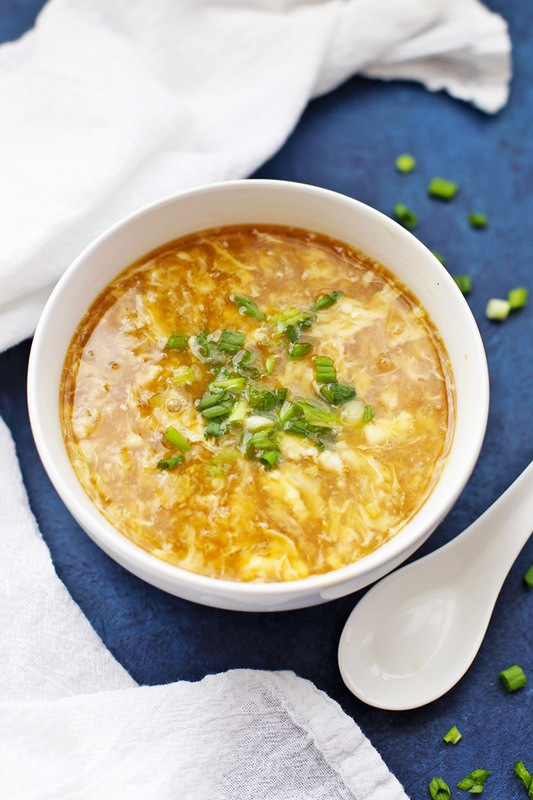 Egg drop soup is surprisingly easy to make and doesn’t require any fancy or specialty ingredients. It’s just chicken broth, a little garlic and ginger, some cornstarch, soy sauce or gluten free tamari, and eggs. Sprinkle a few green onions on top, and that’s it, folks! This soup makes an awesome appetizer, but I often turn it into a meal by serving it alongside these Paleo Chicken Lettuce Wraps (I promise they taste like the restaurant ones!). Once you learn how to make it, it’s SUPER easy to turn into a quick dinner you make all the time. Can I make it paleo? Yes! Arrowroot is more finicky to work with than cornstarch and in my experience, it doesn’t provide as consistent results, but you CAN totally use it if you need to avoid corn/grains. I recommend letting it JUST come to a boil, since it can lose it’s binding powers if cooked/boiled too long. You’ll also swap out the soy sauce/tamari for coconut aminos, which are a great substitute. MAKE YOUR LIFE EASIER! Kids and soup (heck, me and soup!) often = MESS. My kids used to get really frustrated because the soup would just fall off their spoons. I SWEAR by asian soup spoons. They’re MUCH easier for small hands, and great for scooping up all that egg drop goodness! We use them for every kind of soup we eat! A tip for getting the right size ribbons. Everyone has their own preferences, but I tend to like slightly larger “ribbons” of egg in my egg drop soup. To get finer ribbons, stir more quickly. To get larger ribbons, stir more slowly. It’s easy to make this soup too salty if you use high-sodium broth and high-sodium tamari/soy sauce. 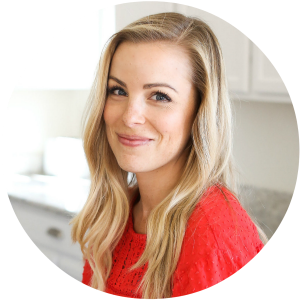 To keep things in check, I usually use low-sodium tamari (or coconut aminos), and homemade or low-sodium broth. For a paleo version, use coconut aminos and arrowroot. In a small bowl, whisk together eggs and egg whites. Set aside. In a medium pot, whisk together chicken broth, cornstarch, garlic, ginger, and tamari. Heat over medium-high heat and bring to a boil. When soup reaches a boil, turn off the heat. Slowly pour the beaten eggs into the soup. Let the soup sit 2-3 minutes for the eggs to finish cooking. (If you need more heat, feel free to put the pot back on a low-heat burner for a few minutes). Garnish with green onions, if desired. *If needed, be sure your chicken broth is gluten free. I like Pacific Foods brand. This sounds yummy even at 9:00 in the morning! 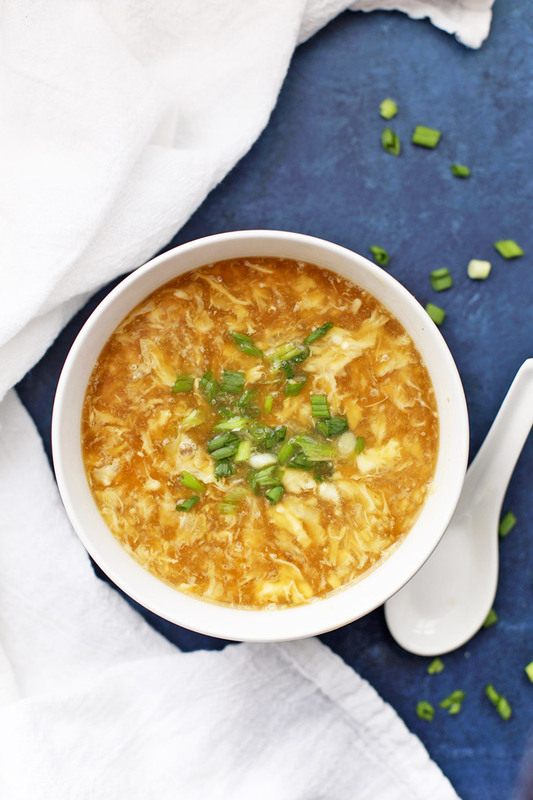 mmm we love egg drop soup so much. we’ve made it a few times at home but can never get it just like it is in the restaurants so we might have to try yours. looks delicious! Toddler tastes are so funny. Evie is obsessed with soup in all its forms. This would be a great option for mixing things up around here. Evie also hates meat (common toddlerism perhaps?). Though she makes an exception for fast food, like chicken nuggets. Of course small “nuggets” of grilled chicken cooked here at home do not meet this requirement. Ahhhh! Kids, they make ya crazy. At least she likes dairy and is obsessed with her daily scrambled egg breakfast so she gets lots of protein. This looks delicious! I can’t wait to try it. Thank you and best wishes for your little one to arrive safe and sound. I’m very excited for you and your family! Would arrowroot powder or tapioca starch work in place of the cornstarch? Marina – I think arrowroot would, though you’d need to watch it, since if it boils too long after adding it, it will lose it’s binding power. I’d recommend stirring it in during the last few minutes of cooking and as soon as its thickened, removing it from the heat. I’d love to know how it works out for you if you try it!